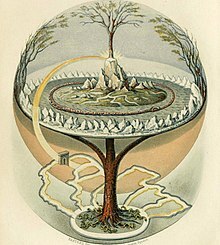 An 1847 depiction of the Norse Yggdrasil as described in the Icelandic Prose Edda by Oluf Olufsen Bagge. He sees the tree of life, whose roots reach into Hell and whose top touches Heaven. He also no longer knows differences: Who is right? What is holy? What is genuine? What is good? What is correct? He knows only one difference: the difference between below and above. For he sees that the tree of life grows from below to above, and that it has its crown at the top, clearly differentiated from the roots. To him this is unquestionable. Hence he knows the way to salvation. To unlearn all distinctions save that concerning direction is part of your salvation. Hence you free yourself from the old curse of the knowledge of good and evil. Because you separated good from evil according to your best appraisal and aspired only to the good and denied the evil that you committed nevertheless and ailed to accept, your roots no longer suckled the dark nourishment of the depths and your tree became sick and withered. know good and evil. Because of this the knowledge of good and evil was an insurmountable curse. 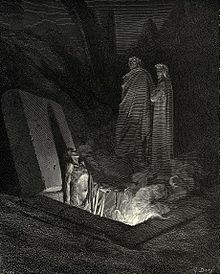 But if you return to primal chaos and if you feel and recognize that which hangs stretched between the two unbearable poles of fire, you will notice that you can no longer separate good and evil conclusively, neither through feeling nor through knowledge, but that you can discern the direction of growth only from below to above. You thus forget the distinction between good and evil, and you no longer know it as long as your tree grows from below to above. But as soon as growth stops, what was united in growth falls apart and once more you recognize good and evil. You can never deny your knowledge of good and evil to yourself so that you could betray your good in order to live evil. For as soon as you separate good and evil, you recognize them. They are united only in growth. But you grow if you stand still in the greatest doubt, and therefore steadfastness in great doubt is’ a veritable flower of life. then he is the strongest. But no one can say yes to his doubt, unless he endures wide-open chaos. Because there are so many among us who can talk about anything, pay heed to what they live. What someone says can be very much or very little. Thus examine his life. Next Next post: Carl Jung: … you have been misled by newspaper reports.